The Interstate 64 Widening Project in the Richmond and Hampton Roads regions will increase vehicle capacity, resulting in immediate congestion relief along one of the most heavily traveled and congested highway corridors to and through the Virginia Peninsula. 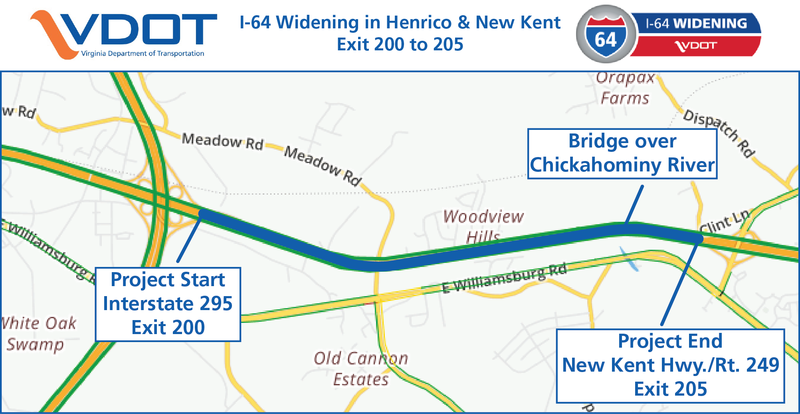 I-64 between the I-295 interchange (Exit 200) in Henrico County to the Bottoms Bridge area (Exit 205) in New Kent County is currently under construction. The highway is being widened from four to six lanes. The Virginia Department of Transportation (VDOT) determined that the use of design-build contracting for this project will expedite delivery and ensure timely authorization of federal funding. Lane closures and construction information is announced in our weekly Highway Alert. Emergency pull off areas for disabled vehicles are available. The trees in the median space will be addressed on a case-by-case basis as needed to accommodate stormwater management and cut and fill slopes. The raised median with concrete barriers will utilize context-sensitive design with low maintenance shrubs or bushes. Modifications to the interchanges are not included as part of this project. However, interchange operations will benefit from the additional capacity of the new lanes on I-64 and the lengthening of the acceleration and deceleration ramps. No major traffic impacts are expected on the side roads. However, congestion may be possible during peak travel times or if an incident occurs on the interstate. This may include some night-time ramp closures. These will be publicized in advance. Work is scheduled to be complete in fall 2019. RICHMOND — At its monthly meeting today, the Commonwealth Transportation Board awarded a contract for approximately $43.4 million to Corman-Branch, a joint venture, of Roanoke, Va. to widen a section of Interstate 64 in Henrico and New Kent counties.